Though your deck may look weathered from years of enduring outdoor elements, there’s a good chance the structure of the deck is still sound. In that care, tearing it down to rebuild a brand new one is a much higher cost than renovating what is still a solid structure. Renovating your existing deck will give it a new lease on life at a lower cost to you! For over 15 years, Larlin's Home Improvement has been providing deck renovation in a timely and affordable manner. The knowledgeable handymen at Larlin's Home Improvement will bring the attractive face back to your deck in a practical way. 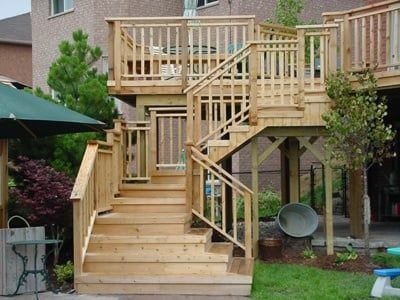 We will provide your deck with strong, safe and sturdy stairs and handrails. We will replace any old or rotting wood with treated wood to ensure a longer life span for the decks structure and footing. Thinking of having a brand new deck installed? Having a deck built for additional outdoor living space is a great addition to any home and will increase your home's value. For over 15 years, our expert team will install the beautiful deck you've been dreaming of. Larlin's Home Improvement can install or renovate wood decks, composite decks or combination decks. Call (203) 267-0607 for a FREE quote on enhancing your outdoor living space by installing or renovating your deck!